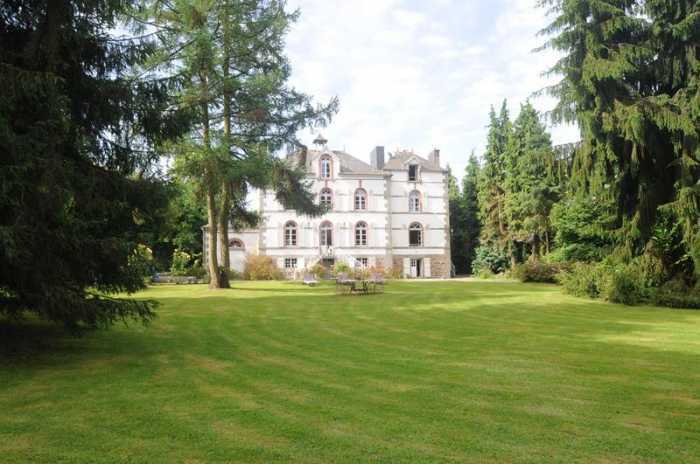 Properties for sale in Brittany, France - AHIB-4-SIF-00764 Vitre area 35210 Fully renovated 6 bedroomed Château with lake for sale with 19,611 m2 about 10 minutes from Fougères and 30 minutes from Rennes. The property has been completely renovated by the present owners and benefits from double glazed windows with shutters, a security entry system, new central heating system, insulation and floors. It offers extensive family accommodation with the principal rooms overlooking the private lake. Viewing is highly recommended. Ideally placed with easy motorway access this delightful Château is only 40km from the UNESCO Heritage site of Mont St Michel, and 50 km from the Ferry Port at St Malo. 50km from the fishing port at Cancale (home of the Oysters), Dinard, the Rance Valley and the Broceliande forest. There is an excellent golf course at Vitré (15km). The medieval town of Fougères with large lake and man-made beach is about 10km away. The ferry port at Caen Ouistreham is 1 1/4 hours' drive and the airport of Rennes St Jacques is about 3/4 hour drive with the city of Rennes half an hour away. 2 sets of granite steps to front door. Entrance Hall : 5.25m² - Tiled floor. Radiator. Glazed double doors to front elevation. Stairs to basement. Cloakroom : 3.57m² - Obscure glazed window to rear elevation with cupboard under., Pedestal hand basin. WC. Tiled floor. Radiator. Lounge : 26.33m² - Window to front and rear elevations. Display recess. Tiled floor. Decorative fireplace. Coving and ceiling rose. 2 radiators. Dining Room : 25.59m² - Window to front and rear elevations. 2 radiators. Tiled floor. Stone fireplace with raised brick hearth. Kitchen: 14.95m² - Built-in cupboards incorporating fridge. Granite worktops. Single stainless steel sink with mixer tap. Pelmet lighting. Radiator. Window to front elevation. Tiled floor. Range style cooker with extractor hood over. Space and plumbing for dishwasher. Tiled and granite splashbacks. Inner Lobby : 3.19m² - Steps down to garden. Radiator. Tiled floor. Door to outside. Study : 7.47m² - Window to south west elevation. Wood flooring. Radiator. Landing : 12.97m² - Wood flooring. 2 windows to front elevation. Radiator. Stairs to second floor. Central heating thermostat. Built-in cupboard. Bedroom 1 : 16.42m² - Double aspect. Ornamental fireplace. 2 radiators. Wood flooring. "Jack and Jill" Shower Room : 3.87m² - WC. Corner shower. Radiator. Obscure glazed window to front elevation . Bedroom 3 : 26.78m² - Door to "Jack and Jill" shower room. Laminate flooring. Window to front elevation. Radiator. Vanity unit. Family Bathroom : 7.02m² - Bath with tiled surround, screen and shower fitment over. Vanity unit withy mirror and light over. Radiator. Window to front elevation. Laminate flooring. Landing : 7.42m² - Sloping ceiling. Laminate flooring. Smoke detector. Bedroom 4 : 8.43m² - Sloping ceiling. Velux window. Exposed beams. Hatch to loft. Bathroom : 3.06m² - Obscure glazed window to rear elevation. Small bath with tiled surround, screen and mixer tap/shower fitment. Radiator. Tiled floor. Vanity unit. WC. Dressing Room : 7.95m² - Hanging space and shelving. Parquet flooring. Velux window. Bedroom 6 : 14.14m² - Windows to front and rear elevations with interior shutters. Wood flooring. Decorative fireplace. Hatch to loft. 2 radiators. Hallway : 4.10m² - Door to front elevation. Tiled floor. Radiator. Games Room : 26.44m² - Part glazed doors to front elevation. Window to rear elevation. Tiled floor. Exposed stone wall and exposed beams. 2 radiators. Wine cellar : Tiled floor. Door to rear elevation. Utility Room : 24.09m² - Window to rear elevation. Partly glazed doors to front elevation. Boiler. Double stainless steel sink unit with mixer tap. Plumbing for washing machine. Electrics. 2 built-in cupboards. Exposed stone. Beautiful wrought iron double gates, controlled by a security entry system with camera, open on to a long private drive which leads to a gravel turning circle, parking, the triple car port and garage/workshop (with loft over). There is a concrete car washing area with drain. Outside tap. Log store. The grounds of the property feature many established trees and shrubs including two rhododendrons which are over 100 years old. The pretty lake has been de-silted by the present owners and is stream and spring fed with an overflow system. It is stocked with pike, roach, perch and grass carp. It measures about one and a half acres and at the deepest point it is about 2.5 metres. Pontoon and enclosed area for ducks. Feature gazebo next to the lake which was bought from a disused Monastry. Wooded area. Kennel and run. Greenhouse. Wooden playhouse/shed. Mains telephone, water and electricity are connected. Drainage to an all water septic tank. Oil fired central heating and heat exchange system (which would be sufficient to heat a swimming pool if required). Broadband internet connection.